Nick Johnson Tries out two innovative British products developed to aid small-scale material screening and movement on site. Bright orange Belle Minimix 150 tip-up mixers are used on countless sites all around the UK. So there should be considerable potential for a clever adaptation that allows these popular mixers to not only produce concrete or mortar but also to effectively create usable topsoil by screening out stones and building debris from waste material on site. John Shakespeare of Wem in Shropshire had the idea of creating a screening drum able to be fitted to a Belle mixer. He had used his MiniMix 150 to produce concrete to secure new fence posts around his property and he wanted to recycle the stony material dug from the fence postholes into good quality topsoil. So what is now called the Multidrum Soil Screener was born. The UK made Multidrum package comprises a three-part soil screening drum and a special dual chute arrangement that fits onto the mixer frame under the drum. 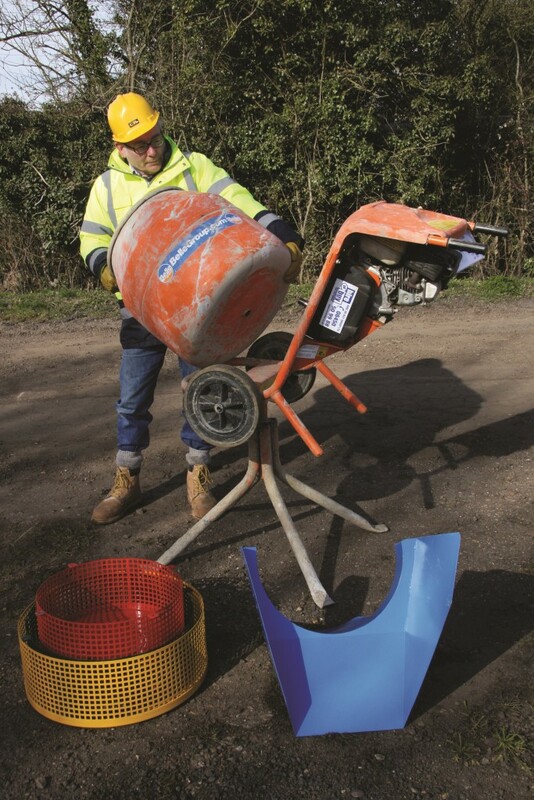 This dual chute allows larger debris to drop into a wheelbarrow placed behind the mixer whist screened material falls into a second wheelbarrow at the front. The opportunity was taken to check two small machines – the brand new MUV Electric Wheelbarrow and JCB’s smallest pedestrian controlled single drum vibrating roller. Designed and made by Nu-Star Material Handling Ltd of Ednaston in Derbyshire, the pedestrian controlled MUV Electric Wheelbarrow can carry up to 400kg of material on level ground at a maximum speed of 6.0km/h. This battery-powered barrow really does take the effort out of moving materials around on site. Nick Johnson removes the standard mixer drum ready to turn the machine into an effective small-scale screener. The CPN test location was on a farm in Bedfordshire where the variety of materials ready for recycling included a mound of soil mixed up with asphalt planings. All the equipment arrived and the Multidrum was unpacked. To facilitate easier transport and storage, the screener drum is composed of three sections which can slot inside each other. The standard Honda engined MiniMixer was placed on its three-legged stand and its mixer drum was simply unscrewed in an anti-clockwise direction and removed. The blue coloured dual chute assembly was then inserted through the frame of the mixer – an operation that would have been helped by a larger and clearer illustration in the assembly instructions. This chute assembly is secured by means of a sliding bracket to accommodate subtle differences in the dimensions of different mixer frames. The three sections of the screening drum were then separated and the smallest, red coloured base drum was securely connected to the mixer by rotating it clockwise onto the projecting drive shaft. Then the intermediate (green) and outer (yellow) drum sections were bolted on to the base drum (whilst ensuring that the large holes in the base of each drum were aligned). The longest edge of the blue chute assembly should clear the inner edge of the largest diameter yellow outer drum but, on the test unit, it had to be bent outwards slightly to prevent fouling during drum rotation. A traditional, hand pushed, wheelbarrow was then placed under the front chute to collect the screened material. 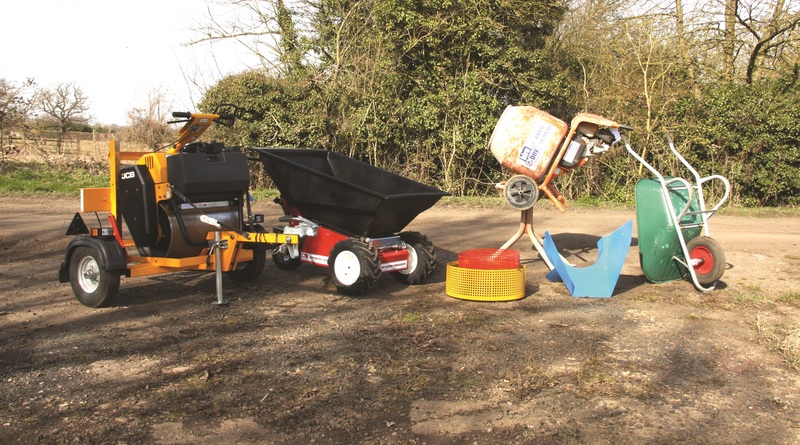 A second wheelbarrow would normally be placed under the rear chute to take the over size material but, during the PB test, the MUV Electric Wheel barrow was manoeuvred into the rear position. Because the skip of this powered barrow is larger and higher than its non-powered counterpart, its skip had to be tipped up slightly to get under the end of the chute. The Honda GX120 mixer engine was then fired up and material shovelled into the Multidrum. The screening process worked very effectively with the finer screened material flowing smoothly into the front barrow whilst the larger stones and debris dropped into the MUV barrow behind. It was found that feeding material into the screening drum had to be done carefully to prevent unscreened material from dropping straight down into the front barrow. An internal flange around the outer edge of the yellow drum might help unscreened material containment but this would prevent the other drums from being carried inside it for transport or storage and it might also allow overloading of the mixer. Screening is best carried out with dry material and care needs to be taken to separate out larger objects such as whole bricks before loading. Material has to be carefully fed into the outer yellow drum to prevent any falling straight down into the front barrow. Unaccustomed as I am to sustained hard manual labour, I quickly became a big fan of the electrically powered MUV barrow. Powered by two EM 90Ahr sealed and maintenance free Gel batteries, this quiet barrow is simple to operate (with a twist-grip throttle and a dead-man’s handle). The MUV Electric Wheelbarrow has an integral waterproof battery charger that can be connected to either a 220V or 110V power supply. Battery condition can be easily monitored by indicator gauge on the control panel. This gauge has ten green LED bars and when all are lit the machine needs recharging. Tests by Nu-Star indicate that a running time of up to 14 hours is possible between charges (which last 9 to 10 hours). Designed to ‘wheel away inefficiency’ the MUV Electric Wheelbarrow allowed Nick Johnson to move and tip 400kg loads without undue physical effort. The test MUV barrow was fitted with 1,200W DC electric drive motors and these coped well with a very full load in the skip. 800W DC motors are available as an option. Maximum speed of the MUV Electric Wheelbarrow with the 1,200W DC motors is 6.0 km/hr and there is a rocker switch to select either fast or slow range. The latter, which restricts maximum speed to 3.0 km/hr, was found to be best for manoeuvring the machine using the handlebars. A second rocker switch is used to select forward or reverse travel. The two front drive wheels and the swivelling rear castor wheel are all fitted with puncture proof tyres. This wheel arrangement worked well on the relatively level loading area and adjacent country lane. But performance would doubtless be more limited on soft or difficult terrain than small dumpers with four large wheels. And the use of a central rear caster wheel means that three planks or a full width ramp are needed for loading onto a trailer for road transport. The MUV Electric Wheelbarrow was loaded with a very full load of the soil mixed with the asphalt planings. The machine had the power to climb a slope and to tip the material using its electric actuator. In addition to regenerative braking provided by a 125Amp motor controller, there is a 6Nm electromagnetic brake for holding the unit on slopes and when in transit between locations. The test MUV Electric Wheelbarrow barrow had a black plastic skip with a capacity of 237 litres. With this skip, the machine is 825mm wide and the unit weighs 242kg. The standard black plastic skip can be easily removed by unlocking detent pins on the sub-frame. This allows the machine to be fitted with an alternative galvanised steel skip or a flat bed body for transporting bricks, tiles and blocks are also available. To compact the material in the potholes, good use was made of JCB’s SD580 pedestrian controlled single drum vibrating roller. This small machine has an operating weight of 185kg and a roll width of 580mm. 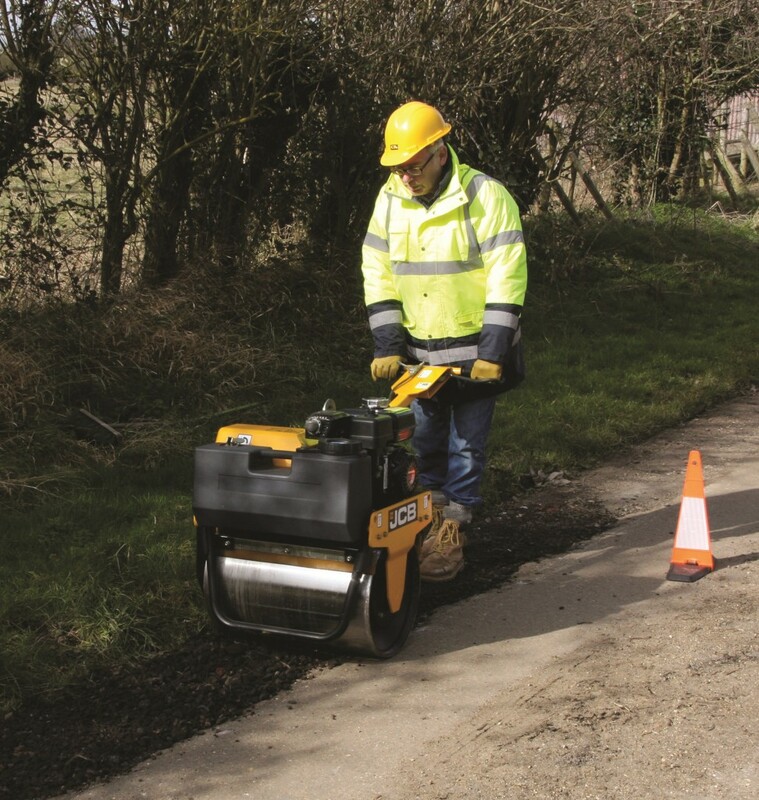 Powered by a 2.9kW (3.9hp) Honda GX160 engine, the SD580 roller delivers a centrifugal force of 10kN with a frequency of 76Hz for use on small asphalt reinstatement and groundcare work. To facilitate working adjacent to walls and kerbs it features a minimal overhang of 12mm on the left hand side. Aided by its 25m/min travel speed the SD580 roller was much easier to move along the lane and use than a vibrating plate compactor. Made by JCB Attachments in Uttoxeter, the roller has a height adjustable control arm (that conveniently angles back over the roller’s body for road transport or storage) with left and right self-centring levers to control direction and speed. The left hand lever incorporates a deadman’s function. The material was first rolled using the machine’s deadweight before further passes were made with vibration deployed. For use on hot asphalt the machine has an integral 15 litre capacity plastic water tank and a water sprinkling system. To aid movement between sites the roller has a central lifting eye so that it can be easily craned onto a plant transporter. As an option JCB can also supply a purpose built VCA type approved trailer. All three items performed well. The Multidrum attachment is well worth of consideration if you have Belle Minimix 150 mixers and there is the need to screen small quantities of material. 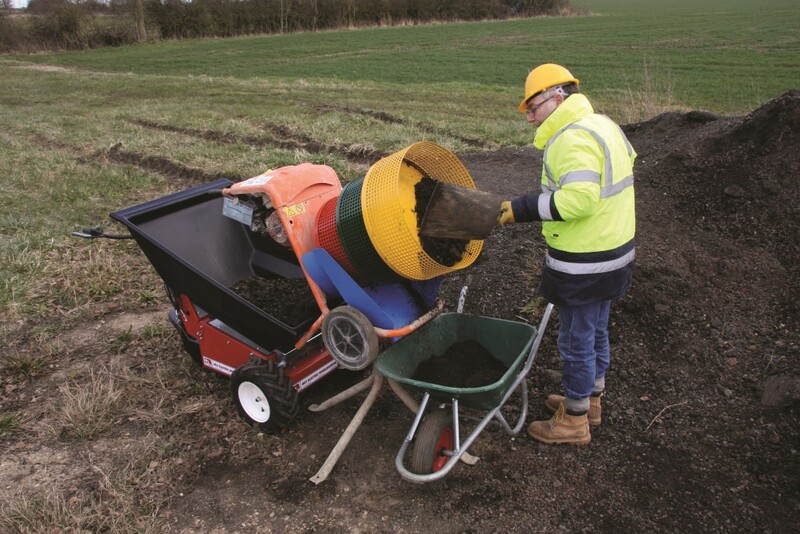 The MUV Electric Wheelbarrow takes the backache out of moving more material, more quickly than a traditional wheelbarrow and the small JCB roller can be easier to use on small compaction jobs than a vibratory plate.